The branding of Ben & Jerry’s “Home-Made” ice cream exploited Vermont’s appreciation of its local dairy farms from its very start: the image of the green grasses that fed Vermont cows and independent farmers helped promote the home-grown qualities of what once passed as artisanal ice cream in America–as much as its super-premium swirled chunks. But fears that the famously reputedly socially-conscious manufacturer of ice cream might lose track of its local origins as it was distributed by the Unilever ice-cream Anglo-Dutch conglomerate seem to have been borne out by the shifting relation of the brand to space, to judge by the relation of the ice-cream maker that long trumpeted its specific geographic origins to the farms that lie in its real and metaphorical back yard. What are the costs at which the Vermont ice-cream maker that cast its use of local dairy–before the allegedly Scandinavian recipe of Haagen Dasz–as a defense of the home-made forsaken its ties to the very state that it once announced as its home? 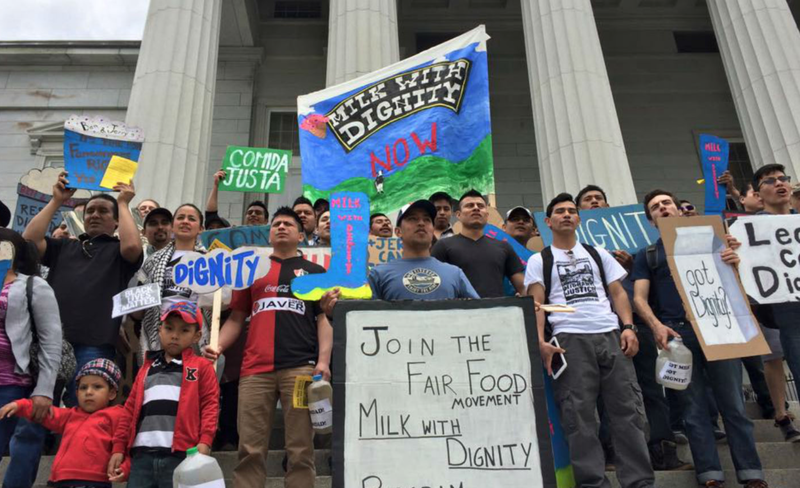 While long known for paying premium prices to Vermont dairy farmers, as well as for its super-premium ice cream, recent questions about the company’s treatment of migrant workers may lift a corner on some deep transformations of its ethos. 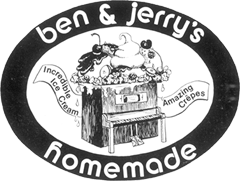 Despite the celebrated smoothness with which the Anglo-Dutch conglomerate fielded a CEO to the guys who marked “Imagine Whirled Peace,” and spun other up-beat slogans into their wares with the abandon of clusters of chocolate-covered caramels and toffee while donating percentages their pre-tax profits, the transition of the ice-cream maker’s identity may have been far less smooth. Despite the continued services provided by listing Flavors We Could Lose to Climate Change on their website, the strained relation between the “local” and “global” is increasingly apparent in the balance between sourcing local ingredients and caring about global issues, even if everyone loves ice cream and the donation of 27,ooo pounds of ice cream to help create the world’s largest sundae merits congratulations–as does all their work in creating jobs with a product that continues to taste good. 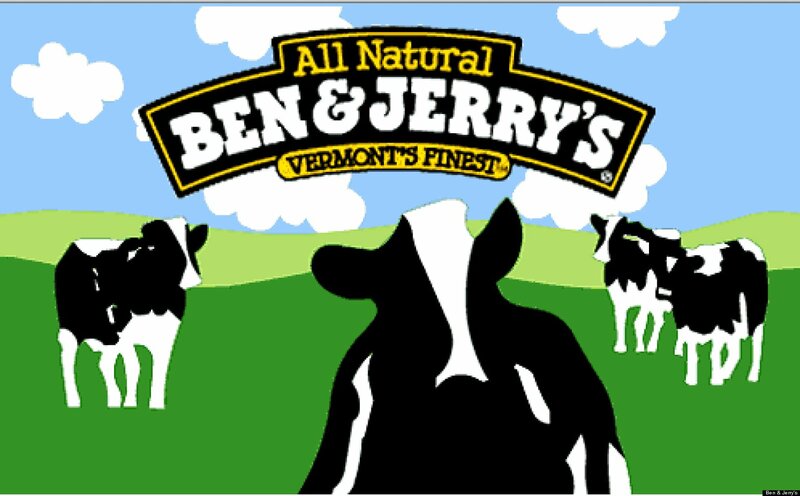 The early appropriation of the image of local Vermont dairy farmers’ cream and milk was no small part of the allure Ben & Jerry’s long cultivated as a locally sourced ice-cream, created only with milk purely from Vermont cows–and co-opting the support for local milk, long, long, before ban-RBGH concerns were even voiced, and when the ice cream appealed primarily to the local sweet tooth, and the milk seemed unproblematically local. 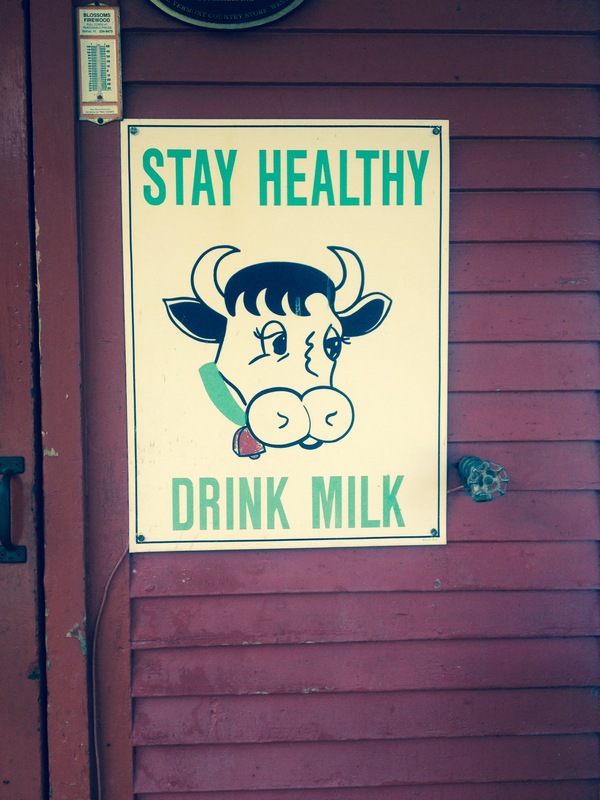 Has the sweetness of Vermont dairy curdled in an age less tied to place, and where the community of Vermont dairy workers is no longer entirely clear? For even as the external values of the corporation have thankfully remained fairly intact since 2001, allowing continued philanthropy, embrace of progressive politics as well as of organic, sustainable, and Fair Trade suppliers,the ice cream maps far less closely onto the local community from which those crêpes and ice cream sundaes first sprung. Ben & Jerry’s Finest ice cream quickly became a local icon in Vermont; its Waterbury location is near the now legendary first site of ice-cream churning with an old VW bus, where it has served as a sort of shrine, tourist destination, and site for indulging in ice-cream concoctions, and the official burial site and graveyard of retired flavors, and the firm has long reached out to support worthy local causes to illustrate the centrality of its membership in the local Vermont community. The brand has of course long capitalized on exclusively using locally sourced cows for its milk and supporting Vermont farmers–years before and after they went public in 1984, and back in the late 1970s. But something slightly odd happened to “all those quirky values” in the agrarian economy of the state and the local status of the brand that is all too evident in the geography of its current Scoop Shops. 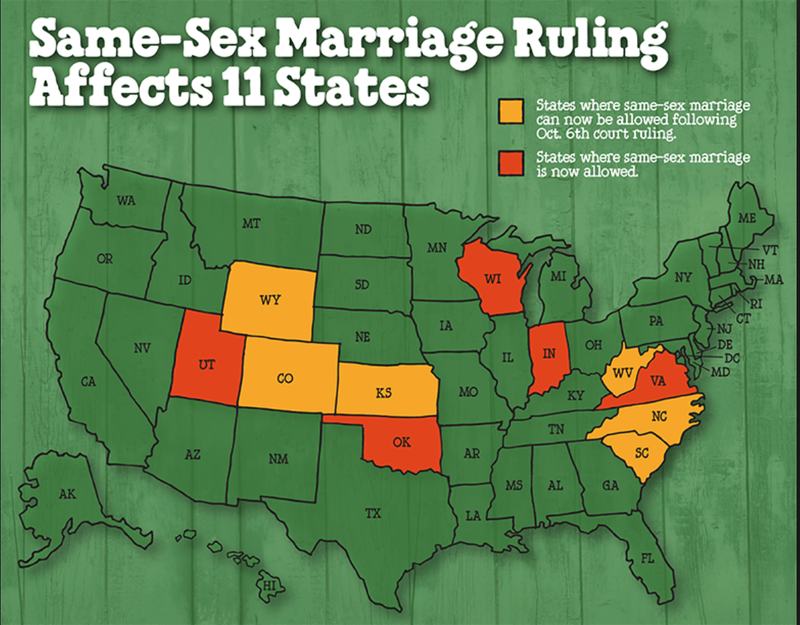 For the renegade ice cream of two regular guys changed from one of the most popular items at local gas stations, general stores, and Scoop Shops in Vermont, to being an object of relative revile in some areas of the same state. 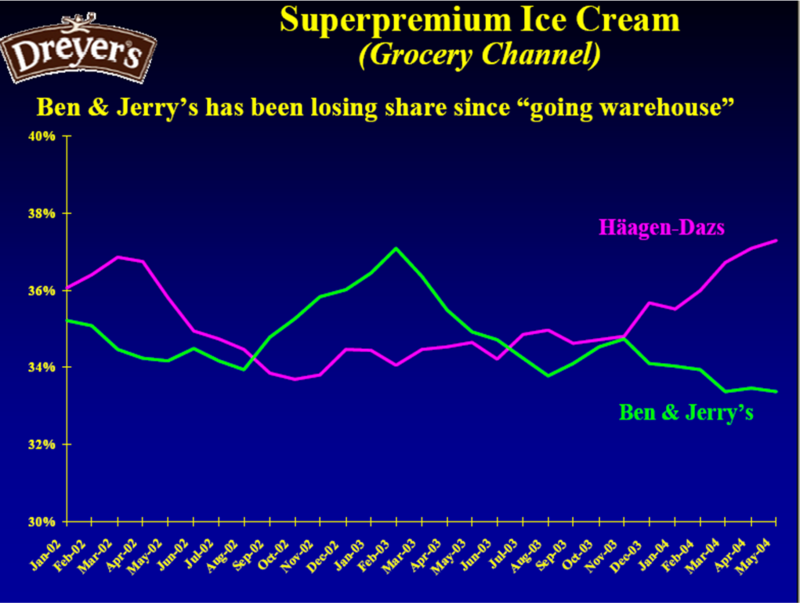 While the celebrated “quirky style” of super-premium flavors boasts by Ben & Jerry’s Homemade was long part of the local geography of a region dotted with dairy farms, the promises of the glocal mission of a corporate distribution of the expanding flavors has swiftly bent the rainbow of Scoop Shops to the forces of marketing with visible results. The result is to warp the landscape of local loyalty, spreading with a density that seemed like broken “Oreo”-style cookie bits throughout the northeast and eastern seaboard, albeit with large, empty distances apparent on Google Maps. 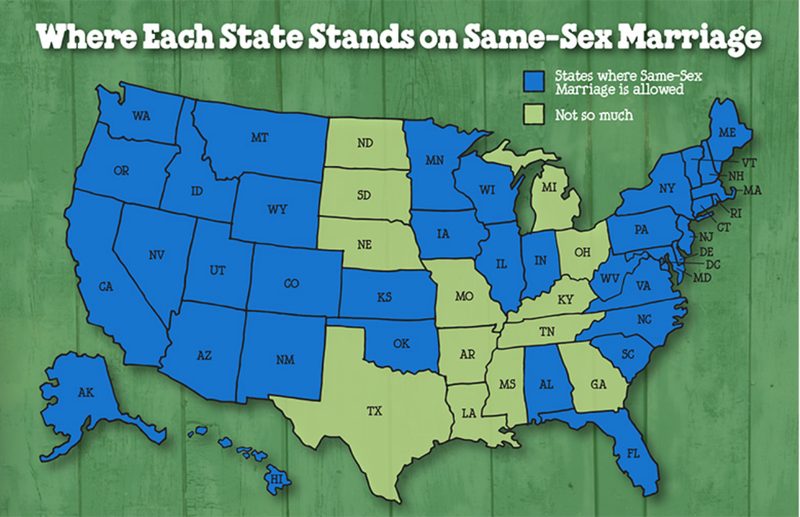 In this condition of national expansion–and distribution world-wide–it makes sense to consider the relation of Ben & Jerry’s home-made is to the Green Mountain state with which it still publicly self-identifies. 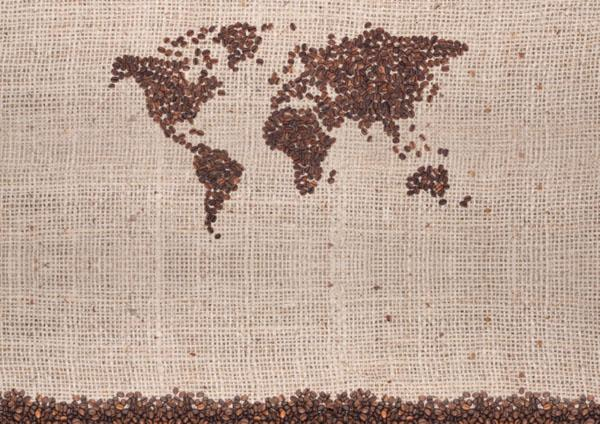 For the embrace of global causes by the ice-cream maker seems to dovetail with the distribution of a globalized world, so that as it has spread across America, the ice cream seems to have become distanced from Vermont. When the store-owner of one store was politely asked whether they carried the ice cream advertised on a poster showing the smiling faces of Ben Cohen and Jerry Greenfield from days gone by, the amiable if gruff shop owner seated directly behind a worn wooden counter replied “Nope,” and when asked why grumbled the equally reticent if slightly exasperated and drawn out “Because they’re assholes,” without further comment. None was needed for the shopkeeper, who kept a worn Ben & Jerry’s post in the window as if in memory of times past. The local shop-owner of few words wasn’t referring to Messrs. Cohen and Greenfield, long locally celebrated stars, but rather to the distributors of ice-cream since 2001, Unilever–an Anglo-Dutch conglomerate who snapped up the once “Home-Made” company, with far fewer ties to the Vermont farmers and stores than the company’s founders, and linked it to the corporate world at $43.60 a share. 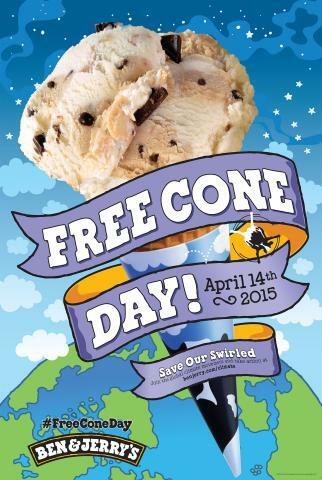 Free cone day–famous as the day that its internet site crashed because it coincided with the hottest day of the summer–was in fact celebrated in relatively few stores in the Vermont area, according to B&J’s own website . . . 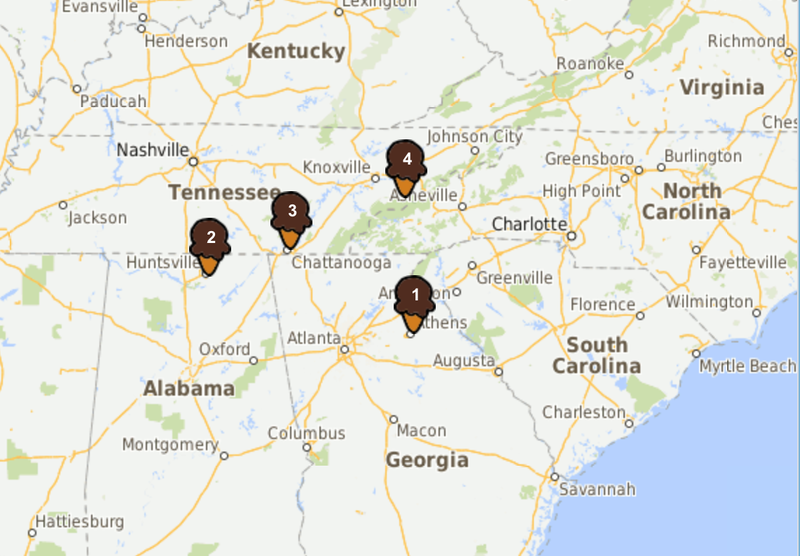 The story of what happened to the local ice-cream after its acquisition by Unilever is interesting to map. The acquisition reflects the transformation of a local success story into a cultivated boutique factory that claims to boast local charm, but ships worldwide to big stores and cultivates college towns, as it neglects its very own back yard. So much is suggested in the relatively glaring absence of celebrated Scoop Shops across Vermont nearby the factory store itself, which still attracts visitors for tours. The story surely demands to be told in relation to the changing landscape of ice cream–a $32.4 billion market in 2006–and the currently quite indistinct relation to the concept of the locally sourced, and depends on supermarket chains where the seemingly ever-more-candied and cream-rich confection is sold. The ice cream makers seem to have themselves cultivated a numinous relation to world freedoms in flavors like ‘Rain Forest Crunch’ and ‘Imagine Whirled Peace’ (an overpowering caramel and sweet cream, swirled with fudge peace signs), the self-satisfied ‘Save our Swirled’ (Raspberry Ice Cream with Marshmallow and Raspberry Swirls, and Dark and White Fudge), pushing new limits of swirling, or ‘Brewed to Matter’ that exclusive uses shade-grown coffee? Is its promise of “euphoria” a bit too stratospheric in its aspirations? The fears of an eventual loss of the small-town culture once cultivated by the successful if once renegade ice-cream makers of Waterbury, who opted to sell their company as the notion of broadening their commitment to social justice was effectively dangled before their eyes, when Unilever co-chairman Niall Ferguson, arriving to meet Ben & Jerry sporting a knapsack rather than attache case, addressed concerns by promoting his own interest in sustainable agriculture for three hours, and then let Richard Goldstein, head of Unilever’s North American operations, approach Ben Cohen himself with the words, “Ben, do you realize the opportunity you have here to help this company grow in its social commitment?” as a teaser of the still-greater “social impact” the ice-cream maker might have in this new business arrangement. 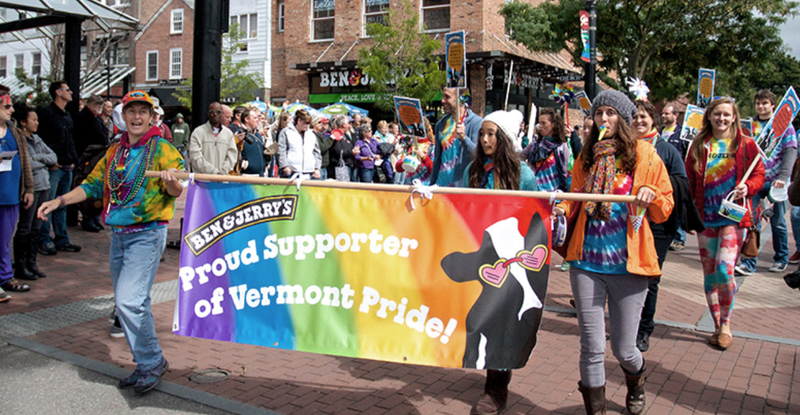 Is the political platform of Unilever offered, by allowing the ice-cream to go “hands free” that can promote social causes also a bit of an inevitable abandonment of the very rootedness in the Vermont dairy community that once defined the ice cream’s core values in the days before it marked such core centers as fudge, caramel, or real raspberry jam? 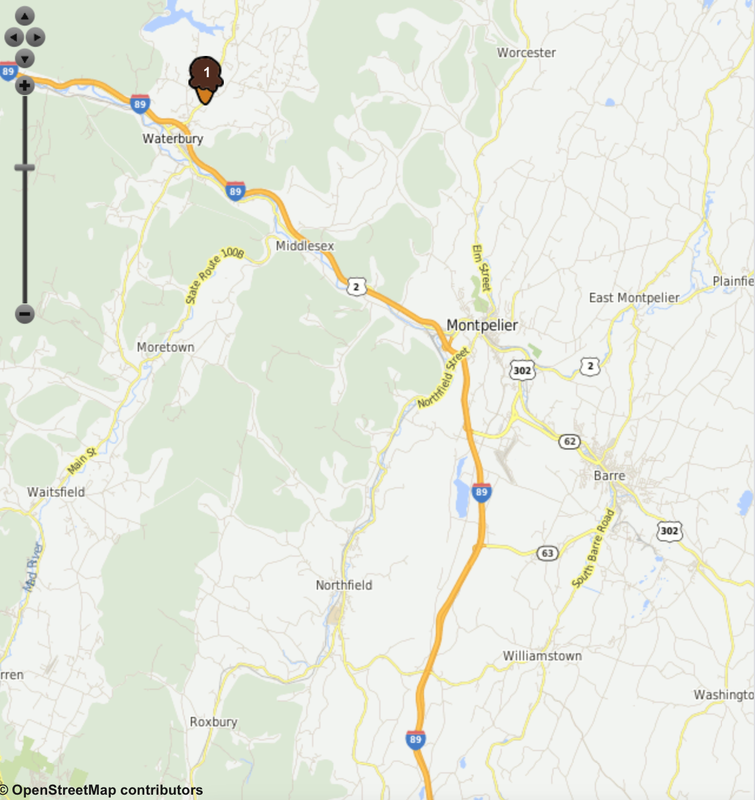 One visible consequence of “going warehouse” is present on the map. The distribution of scoop shops in the state of Vermont sharply reduce once abundant celebrated stores on the state map. For the distributors of the locally produced ice cream have, in a snub to their clientele, closed many of the very shops that once sprouted up with the density of candy and cookie bits that once seemed so specific to the super-premium ice cream. 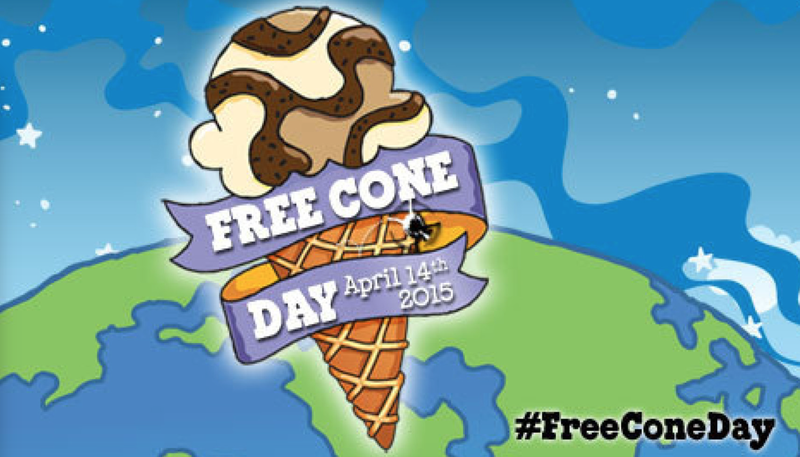 The maps displayed on the company’s website which allows customers to find the stores nearest to their zip suggest the considerable costs of the greater remove from Vermont at which that buyout came–and of the shift to a global/glocal ice-cream that the company adopted in its new corporate guise. Panning out nationally on the OSM slippy map, one finds a paltry three Scoop Shops in the state that once seemed inseparable from the charm of an ice cream that promoted local values, but seems now more glocal, and more with an eye on outside markets than the state for which local farms were long said to produce the milk and cream–or the notion of Scoop Shops were less appealing, and too much overhead, in comparison to supermarkets after the big acquisition removed the ice cream from the community, and its social mission expanded to making “the world a better place” by taking on climate change through Rain Forest Crunch and GMO farming through its reliance on somewhat carefully sourced ingredients, and its economic mission geared primarily to “sustainable financial growth.” Although “climate justice” is difficult to see as compatible with a product that depends on refrigeration, long-term trucking, and huge freezer storage space in the warehouses it employs to distribute its product nation- and world-wide–despite some notable attempts to introduce innovative low-energy freezers. 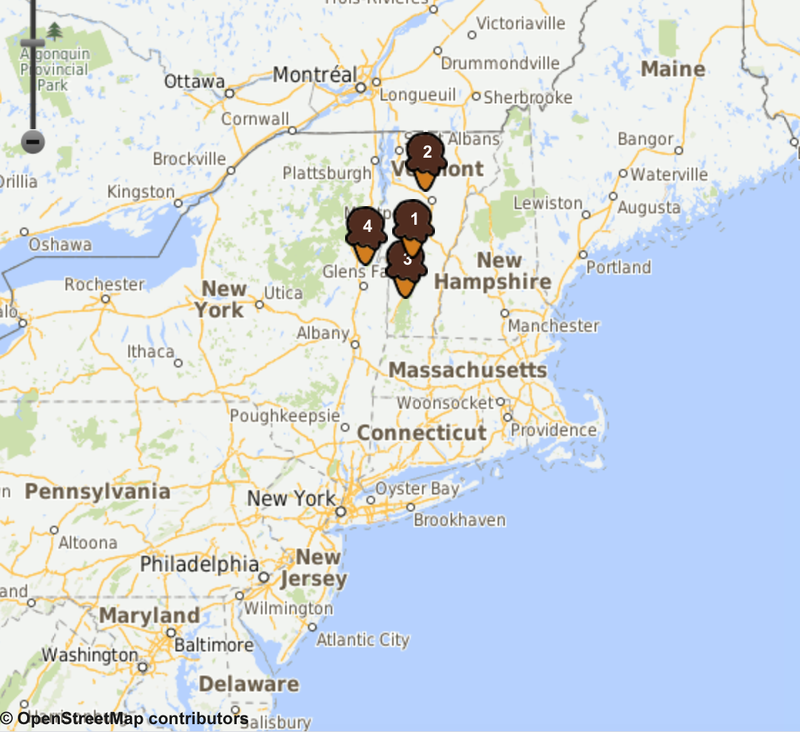 Those few Scoop Shops easily located on the company website indicate the increasingly market-driven nature of the locations of a chain that seems somehow less based in Vermont, site of its main factory that offers year-round tours. 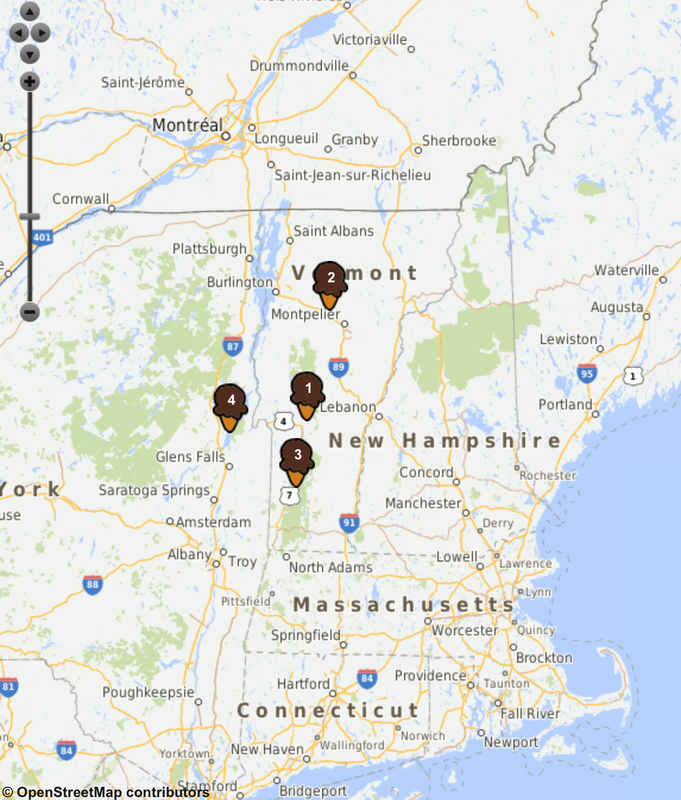 A cute map uses chocolate ice-cream cone designators that pop out of whatever landscape “near me” at its website–yet few stores have survived in the state apart from three scoop shops in Waterbury, Burlington, and Rutland. One can’t go home again, to be sure. But is the disappearance of the local in this once locally-produced confected treat more symptomatic of a deeply corporate design of the marketing and the production of ice cream? For the production of an ice cream that long vaunted locally sourced milk from Vermont dairy farms seems to depend far more on migrant labor–and poor working conditions–than the brightly colored ice-cream containers would suggest. But has the ice cream once boasted “Vermont’s Finest” deeply divorced itself from the site of its first success? For the recent spate of complaints and protests that the ostensibly socially minded brand of super-premiums actually rests on the sweat of migrant workers and low wages raises more than an eyebrow about the wage and labor conditions that go into producing all those rich flavors, and cannot but echo the chagrin of the local shop-owner. For the problems of profit-sharing–almost a mantra in the early days of the ice-cream makers–has launched a Milk with Dignity (MWD) campaign that aims at improving the living conditions and wages as well as work conditions of the 1,200 to 1,500 migrant workers who help manage milk production on Vermont’s 868 dairy farms. The sort of demands for greater autonomy and a say in working conditions is not specific to dairy production or Ben & Jerry’s ice cream, but range from better housing to leave time in ways that would surely fluster the former ice-cream makers. For despite the vaunting of global causes on the tops and sides of those containers of ice cream, the local conditions of work for many seem horrendous, and hard to defend. Of the workers recently surveyed, some 40% earned less than the minimum wage. Many lack health insurance, are denied medical care, or allowed breaks for eating during their workdays, which sometimes exceed twelve hours in length–in ways hard to square with the company’s stated social mission or its stated ethical imperatives from fair-trade bananas to non-RBGH milk, or cage-free eggs. Despite the continued window dressing of imperatives that resonate with Whole Foods, the ’s signature do-gooder brand seems to have neglected the workplace conditions of many of the dairies with whom it contracts, and failed to adopt an agenda of improving workplace conditions besides vague hopes that try to link humane farming practices about cultivating a work/life balance.